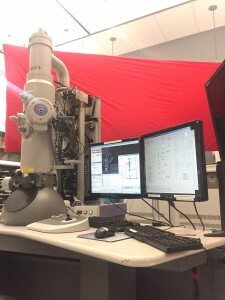 This transmission electron microscope is typically operated at 80 kV and 120 kV. The electron source is provided by a Lanthanum hexaboride (LaB6) crystal or a Tungsten (W) filament. It offers high performance, versatility, high productivity and ease of operation. The fully motorized eucentric goniometer stage (CompuStage®) can be tilted to ±80°. The unit is also equipped with a high-resolution, high-contrast, thermoelectrically (TE) cooled Gatan Orius® 1000 dual-scan CCD camera. It acquires 4008×2672 digital images, using Digital Micrograph(DM) software.